We begin alone in contemplation and practice. We awaken in harmony that cannot be grasped. We don’t know precisely when Shi Ke drew it. The day, unfixed by coordinates, ambles somewhere across the Tenth Century’s calendric grid. But it must have been a sunny day for such history as we have informs us that the Master, preparing to execute his composition’s major strokes, picked up a handful of dried grass, squeezed the clump into a brush, and lapped the bristles round the ink tray until they were soft enough to yield to rice-paper demands. If we look carefully we can hear the monk snoozing in soft cadence to the tiger’s steady purr. “Two Minds In Harmony”, Shi Ke called the work. What was he trying to tell us when he furiously scribed into existence this mellowed, dozing pair? What else do we see? On gross examination the two figures are conformed to suggest the “on guard” position of the martial artist’s hands: the right hand is contracted into a fist and the left hand is laid securely upon it. Together they are furled and held before the chest. The configuration is an ancient diagram of polarity: Yin/Yang. Shakti/Shiva. Power and the Law Power Obeys. The fist is power, emotion – movement away from. The overlaying hand is law, intelligence – the internal governance of reason, a hand position which reminds the martial artist that his mind must always control his use of force. What happens to this Yin/Yang hand-configuration when the man who is poised for combat becomes the man who reposes in meditation? As the function is reversed, so is the hand position: the clasped hands are simply inverted, rotated l80 degrees, and gently relaxed, the left hand going from suppression to support and the right hand from fist to cup – a spiritual begging bowl. Indeed, the meditator assumes a passive posture and in a conscious act of supplication surrenders to the Buddha within himself. 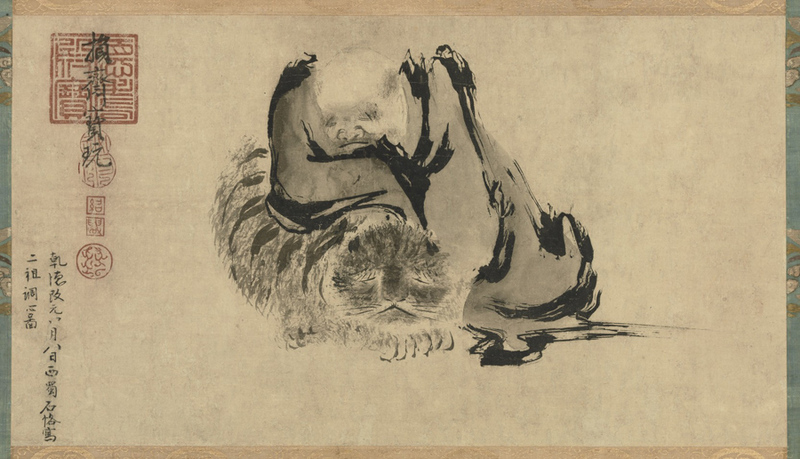 But the Yin/Yang configuration suggested here is neither that of combat nor of meditation since both activities require an alert awareness; and the monk and tiger, in this Yin and Yang embrace, drowse as a unit in blissful oblivion. Again, what is Shi Ke trying to tell us? We know that in our everyday lives of chopping wood and carrying water we must balance emotion and reason, the interests of eros and logos. We know that we cannot have a harmonious performance if we entertain one member of a duet to the exclusion or disadvantage of the other. The harmony of tiger and monk has not been achieved, let us quickly add, by the victory of some vaunted superior human nature over an equally mis-termed inferior animal nature. Dogs can be more loyal than men; cats more affectionate than women. We should all improve from the company of wolves. Neither can we suppose that the drawing conveys the idea of sexual hegemony: male sovereignty over some vassal female state, Creative over Receptive. Science has taken us beyond supposing that “seminal”; conveys the fact of “seed”, that the male supplies a pret-a-porter zygote needful only of a convenient female’s nutritional depository. The Yin and Yang concept admits to no such facile interpretation. Were this an intended meaning, Hexagram 12 (Heaven over Earth) would be a desirable one; it is not. It indicates No Progress… Disjunction… Obstruction. And the left or “sinister” hand would be represented as the female force. It is not. The right hand is the fist. It is a matter of artistic license to term certain qualities feminine. But feminine is not female. In order for any human being to be complete the qualities so described must be equally present and harmoniously blended with those qualities designated as masculine. But this message, however valid, is mere commonplace, too jejune and trivial in its limits… hardly enough to engage a master and surely insufficient to inspire him. What, then, is Shi Ke so determined that we see? Where are the dynamics of intellect and passion? Isn’t the slumber an expression of peace, and the peace an implication of harmony? Isn’t he illustrating the Seventh Day… The Day of Rest… The culmination of effort… the stasis of sleep? 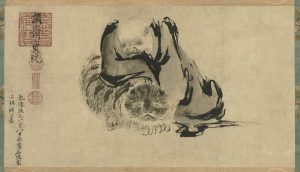 Shi Ke has depicted the transcendence of opposites: the passing beyond prejudicial judgments of good and evil, of male and female, of eros and logos, of need and satiation, of conflict and repose; and, most especially, of ego and other. There is no more Yin and Yang. The distinctions are obliterated. Sleep has emptied the Circle. Shi Ke has taken us into the Nirvanic Void. This is the effortless state of simply Being… a freezing of the pulse, a stoppage of the Turning Wheel, an end to the alternations of struggle and repose. Sunyata. Perfect entropy. The heat death of Samsara. This work is attributed to Shi Ke of the Hou (later) Shu kingdom in the period of Five Dynasties. 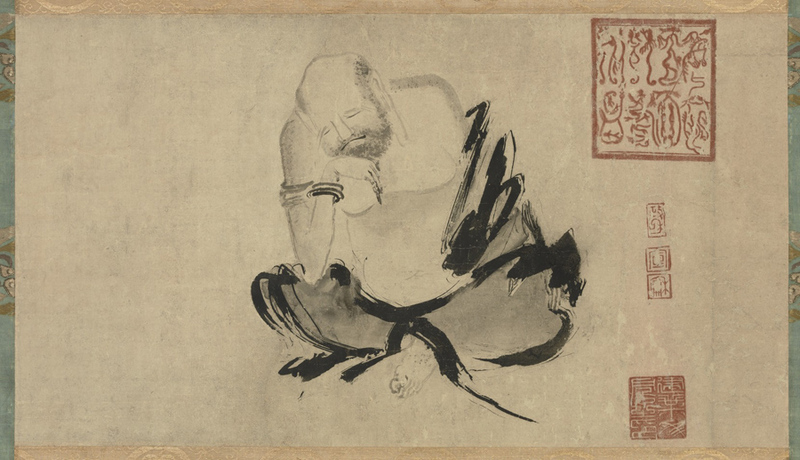 He studied under Zhang Nanben (張南本), who was a master at painting fire, and was good at figure painting. 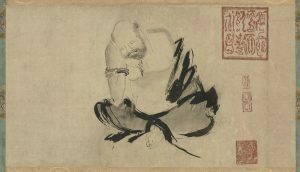 Although he did not care what other people think and pursued his own free style with ease, Shi Ke’s painting style, where faces are painted in details while clothes are drawn with simple strokes became the standard for subsequent figure painting in China.